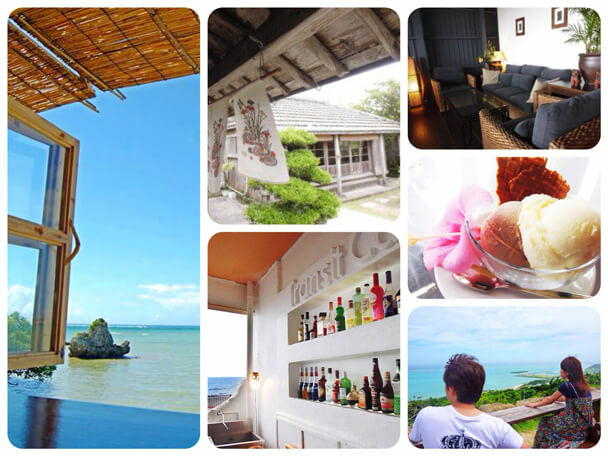 Home Main island of Okinawa(all area) 10 Cafés You Must Try in Okinawa|Recommended by Frequent Okinawa Visitors! 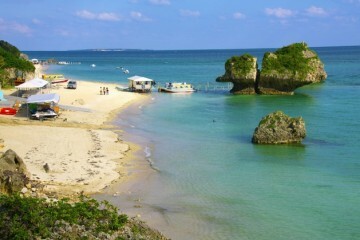 Speaking of Okinawa, I definitely think of the shiny ocean, the steady breeze, and nostalgic scenery! 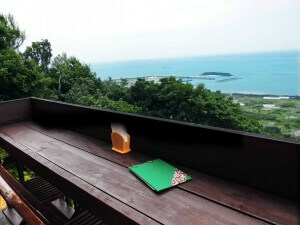 It’d be the best vacation if you could enjoy aromatic coffee and mouth-watering cake with such scenery, wouldn’t it? 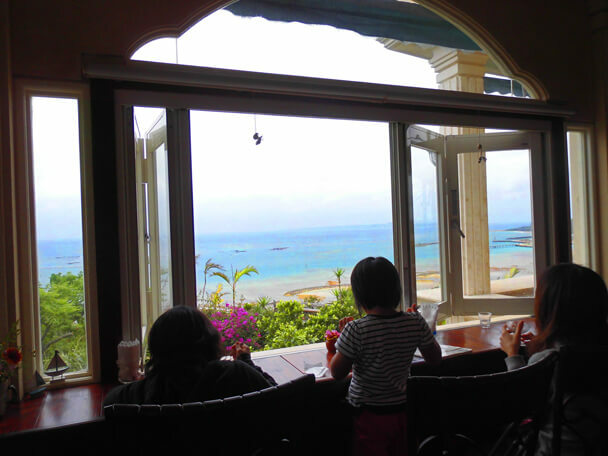 To make that happen, I planned a trip to Okinawa to exclusively visit cafés. 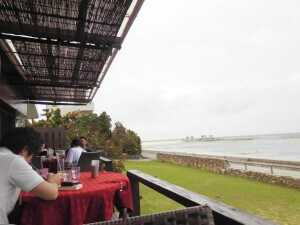 I got frequent Okinawa visitors, who go to Okinawa almost every year, to share their recommended cafés with me. 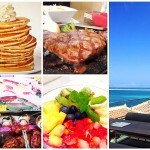 On this page, I’m sharing my thoughts from having actually gone to try the cafés. 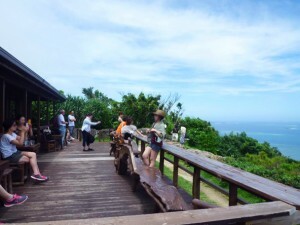 I’m going to show you the cafés in three categories; “cafés with spectacular ocean views”, “local menus”, and “distinct Okinawa buildings”. 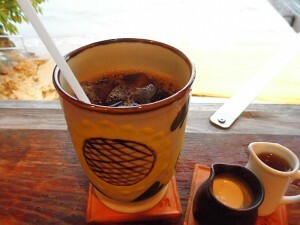 The meaning of the name, 浜辺の茶屋／Hamabe no Chaya, is “Cafe by the Sea”. The location is as it sounds, and ripples approach right beneath the windows at high tide. Since the beach is shallow, the sound of its wave is calm. 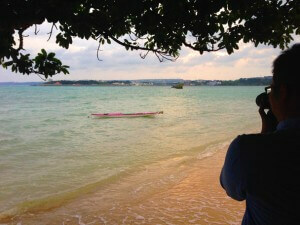 As I gazed at the ocean, I felt relaxed and as if weight had been taken off my mind. 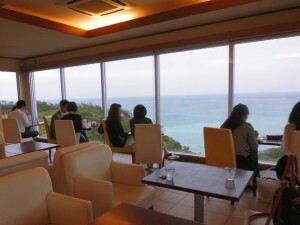 Seats at the terrace are also relaxing but I recommend seats at the counter by the windows. Two people can sit by each window. 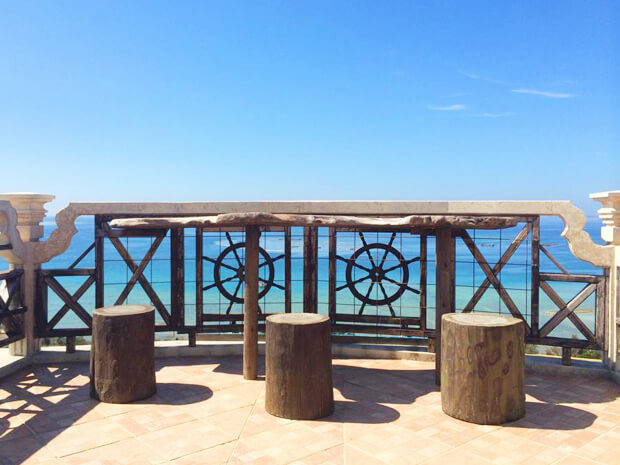 Once you have a seat, the only thing you see is the ocean. It makes you feel like you’re in a space reserved for yourself. It’s a mystical sense of relief. I recommend iced coffee served in a sunflower cup. I drink coffee daily, but it was the best iced coffee I’ve had in the last year. It has the perfect bitter taste and it’s smooth to drink. The expansive scenery from the windows changes entirely as time goes by. 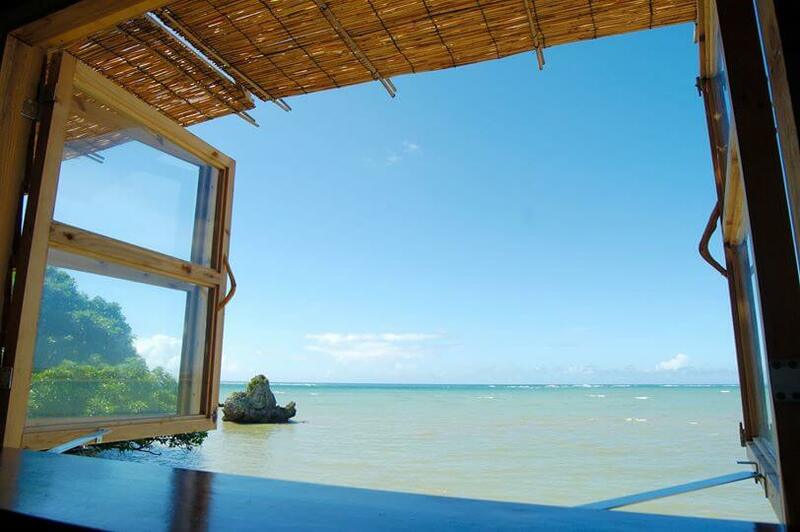 You’ll enjoy the abundant flow of waves at high tide. 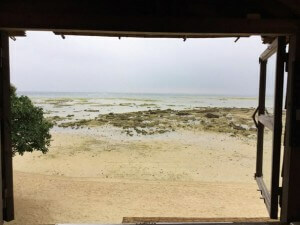 At low tide, a beach that emanates an overwhelming sense of freedom appears, and it seems like you can walk it endlessly. Not available. Please write down your name on the board and wait if there’s a waiting line. Spectacular scenery that would make anyone say “wow” as soon as they behold it. 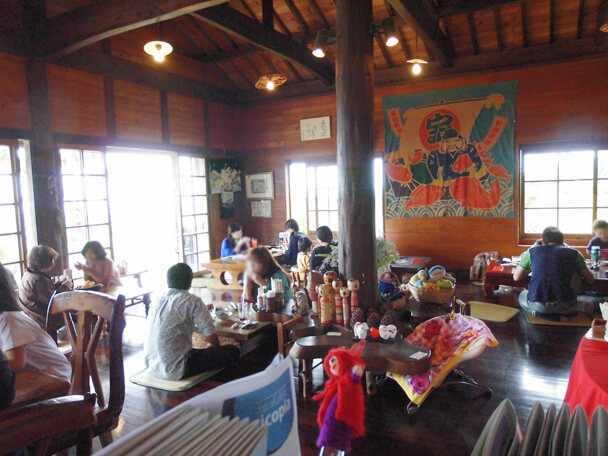 It’s a popular café with relaxing seats on the deck. There’s a spacious park-like garden outside of the store. 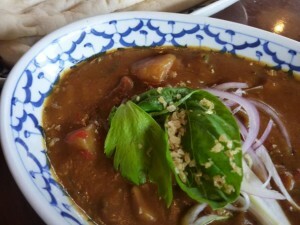 I recommend the authentic Thai curry! Ask the staff if you’re not a fan of spicy food because the curry is pretty spicy. Agu pork curry and Agu pork sausages are also good choices. 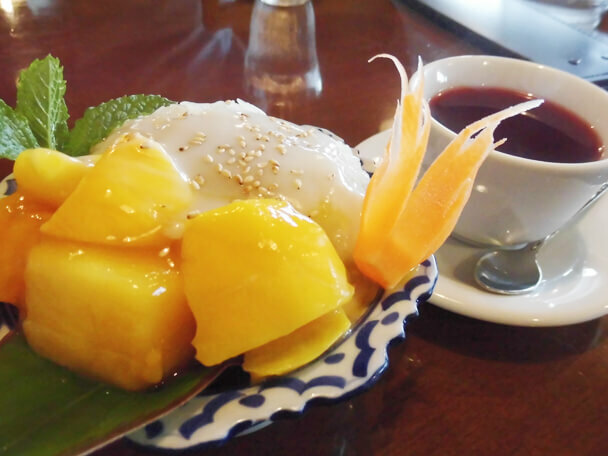 There is also plenty of Thai sweets on the menu, so it’s also great for an afternoon break. 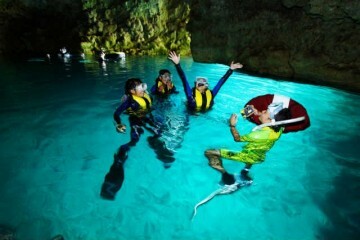 [Recommended Point] You’ll be astounded by the scenery as soon as you enter! 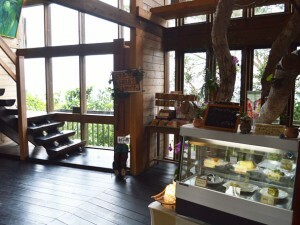 The moment you enter the café you’ll think, “I’m glad I came!” It’s a beautiful café with a huge panoramic view. White sand at low tide and a sparkle of turquoise blue are beautiful at the Hyakuna Beach that spreads below you. 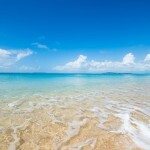 When the tide is high, the contrast of the turquoise blue in front and the vivid sky blue color that becomes imperceptibly darker is extraordinary. Thanks to the glass wall and its location overlooking the beach from a high point, you can fully enjoy the views of the sky and the ocean. The menu is also fancy. 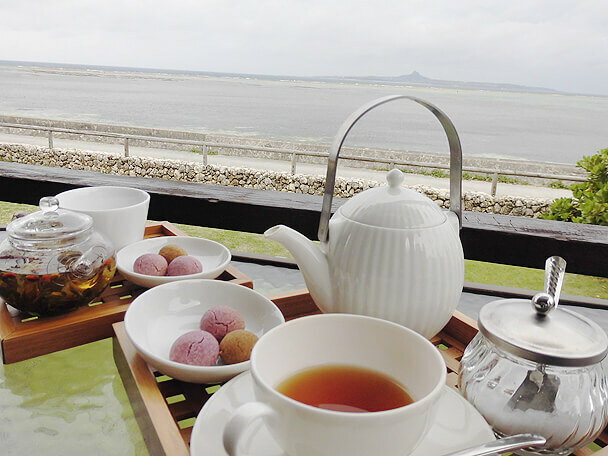 In addition to the sweets made with carefully-selected ingredients, I recommend drinks which represent Okinawa, including the “red perilla vinegar drink” and “Okinawa herbal tea hanacha”. When I received my drink, the staff at the café told me, “Try and crush the mint in the drink if you’d like.” So I tried it. I pushed the green leaves with a straw to the bottom. 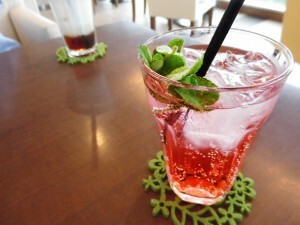 I crushed some and tried the drink……it was refreshing! It’s perfectly soothing. With plenty of mint in the drink, I was able to enjoy the nice aroma until the last drop. Ice cream is definitely a must on a hot day! Eating ice cream at the perfect location overlooking the ocean is outstanding. 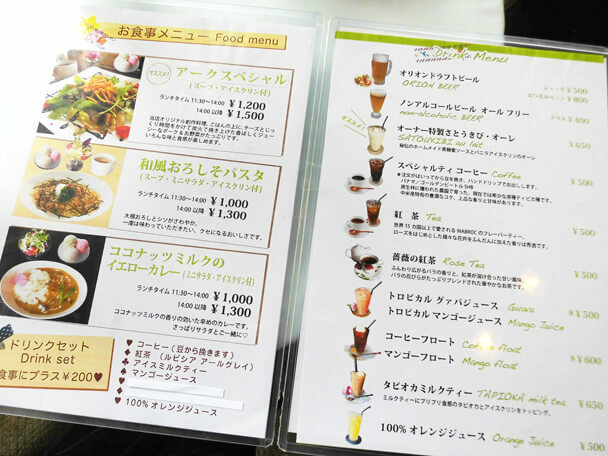 As for the flavors, a menu using local produce in Okinawa—such as shekwasha, purple yam, Tankan orange, guava, and passion fruits—is available. 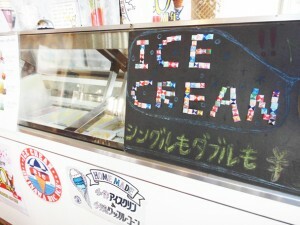 In Okinawa, you’ll find “icecrean” parasols where they sell ice cream on the side of the road in summer. 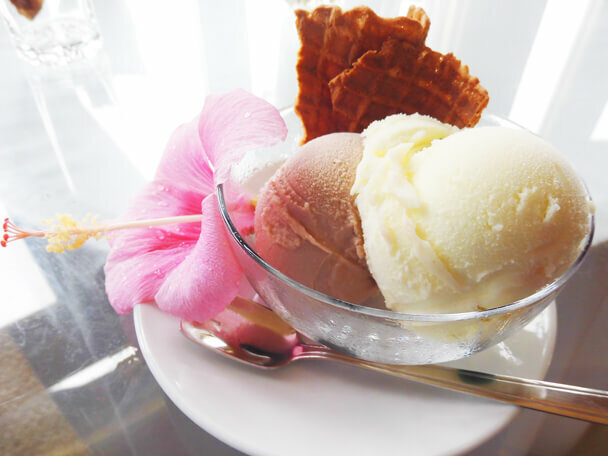 This “Icecrean Café Ark” is a café directed by “icecrean”, celebrating its 40th anniversary this year, and which has been Okinawan’s favorite. 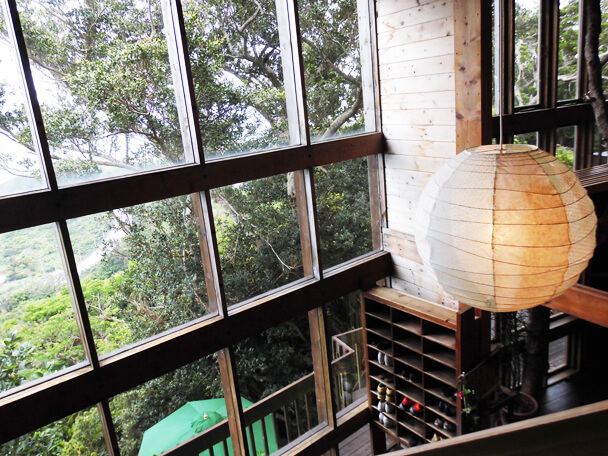 A stylish exterior that many people say, “Looks like “Howl’s Moving Castle“. 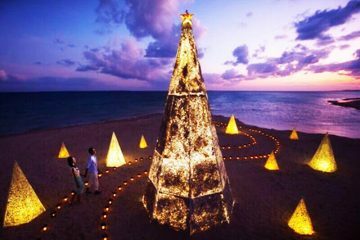 Flowers and seaside-themed ornaments strewn about and decorated by the owner’s hand will make visitors excited. 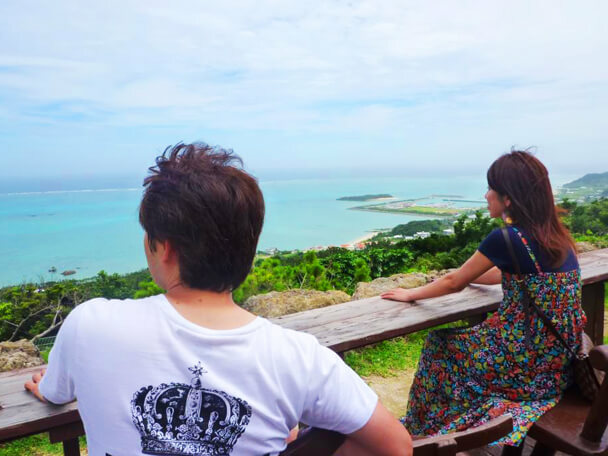 the first thing that comes into view is the endless blue ocean! 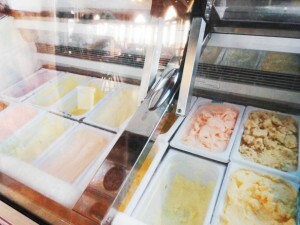 Now, let’s choose the ice cream. 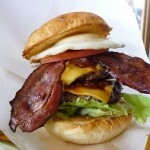 Both single and double are ¥500. So, why not pick double? 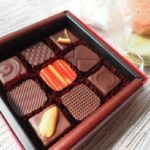 According to the staff, chocolate is classic but popular. 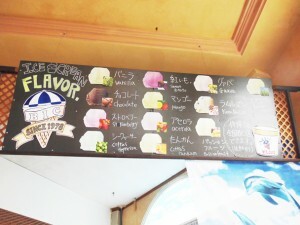 But I got to try Okinawa-like flavors as well…… so I decided on these. Purple yam & vanilla and chocolate & passion fruits (the chocolate is cocoa flavor)! Icecrean’s ice cream is relatively light flavored. You will not get tired of it. Even though it’s sweet, the flavor doesn’t linger, in a good way. I had four flavors little by little. 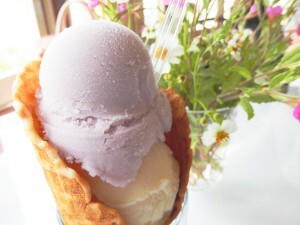 The handmade waffle cone is also good. It’s crispy! 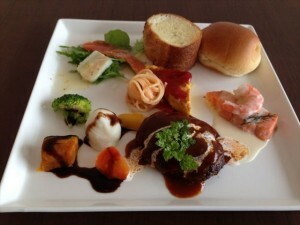 In addition to twelve flavors to choose from, various lunch & drink items are also offered. 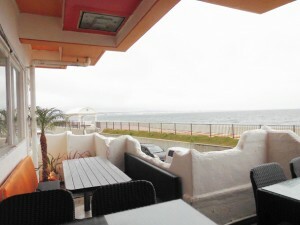 A pleasant sea breeze wafts through the café. 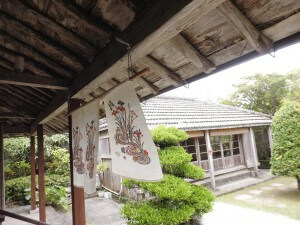 Look around the dearly decorated store interior and be dazzled by the scenery. One hour passed quickly with two scoops of ice cream. I recommend going to the terrace on the rooftop on a sunny day. You’ll find scenery that you’ll want to gaze at forever! 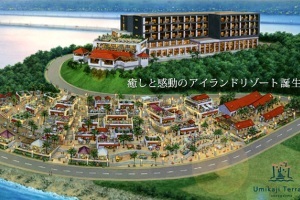 The store is located at am approximately 15-minute-drive from Churaumi Aquarium. It’s also nice to stop at the store after enjoying the aquarium. However……to be honest, it’s very hard to find the store. Even though I put the address on the car navigation system, it only guided me to the approximate area. Once you get near the café on the hill, it’s just a tiny road up the hill. I don’t recommend it if you’re not confident about driving in Japan. However, once you get close, you’ll find signposts everywhere! 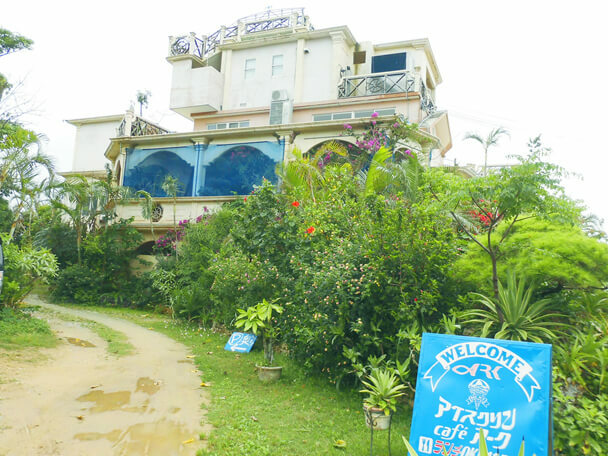 From 11:30 a.m. until the evening *Last order for meals is at 4 p.m.
“Cafe CAHAYA BULAN” is here. 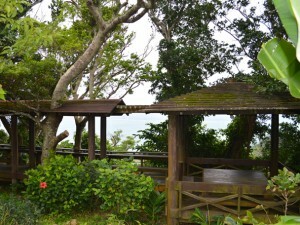 At the end of the stairs, you’ll find a vibrant wood deck and the emerald green horizon. The store has a chic but cozy interior. With the background music playing softly, I checked the menu. Amazingly, there is a unique Okinawa lineup. As for tea, for example, benifuki tea, goya tea, shell ginger tea, jasmine chai tea…… every tea is made with local tropical produce. In addition to these, plenty of Asian teas, including white peach tea, dong ding oolong tea, and champagne oolong, are available. 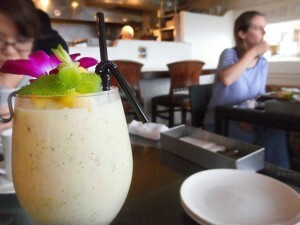 Smoothies are also made with unique ingredients from southern country and Okinawa, such as goya pineapple, chinsuko chocolate, hibiscus, strawberries, and mango milk. For those want some alcohol, try the local beer. 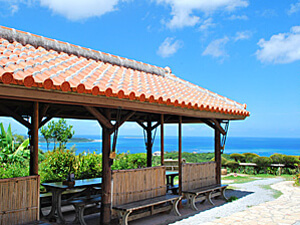 The famous and most consumed beer in Okinawa, “Orion Beer”, is available as a draft beer. “Aoi Sora to Umi no Beer (Blue Sky and Ocean Beer)” and “Goya Dry” by Helios Beer are also available. If you want to experience something stylish, I recommend craft tea. 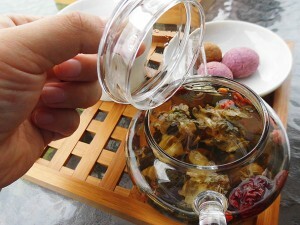 Colorful flowers float in the glass teapot. 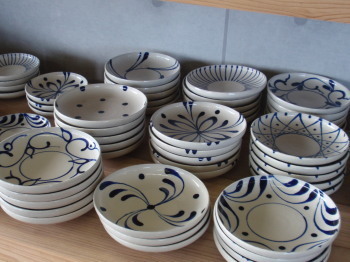 It’s exciting that the tea set is served with round chinsuko. 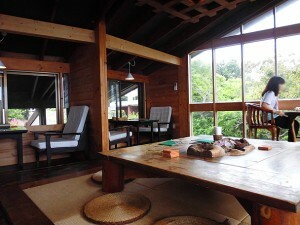 Approximately 500m from Churaumi Aquarium! Also recommended for a tea break on the way home. 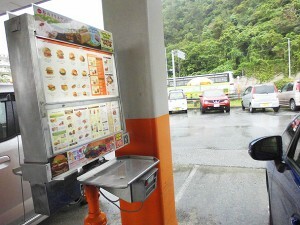 *Last order for meals is at 4:00 p.m.
Fast food chain restaurant, A&W. You sound like Uchinanchu (people of Okinawa) if you call it “enda”. I went to the restaurant because it’s a fast food chain restaurant that only has stores in Okinawa, and no where else in Japan. They serve the drinks regularly sold at vending machines in the U.S. military bases. 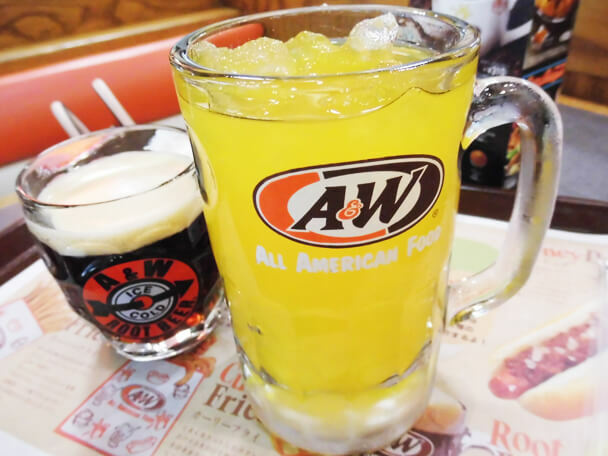 First of all, “A&W” is a fast food restaurant started in the U.S. with franchises around the world. 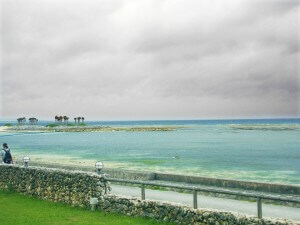 In 1963, the first franchise opened in Okinawa when under U.S. governance. 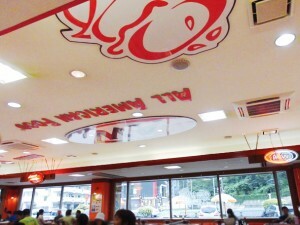 Although it’s a global brand, it became a local restaurant in Okinawa because it didn’t become popular outside of Okinawa. 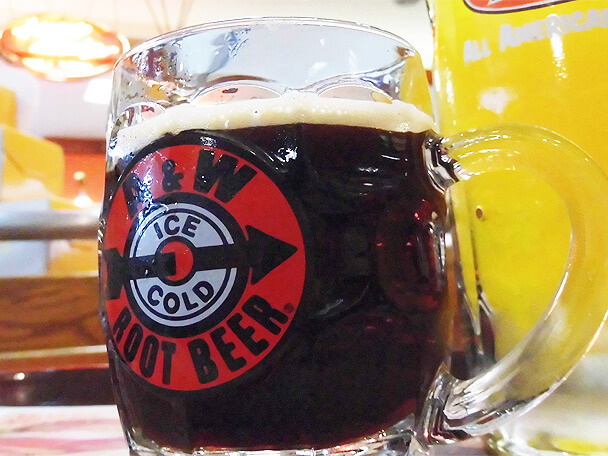 The most characteristic item is their featured product, “Root Beer”. Although it’s called beer, it’s not actually beer. It looks like coke but you’ll probably choke if you drink it assuming it’s coke. It’s because it smells and tastes like some kind of herb. It’s sweet and bitter. It’s carbonated and still tastes healthy. It’s unusual. Also, it’s all-you-can-drink if you like it! Although I didn’t get a refill, I’d personally drink it again. I looked over the inside of store and saw customers of a wide range of age groups relaxing in the American interior. 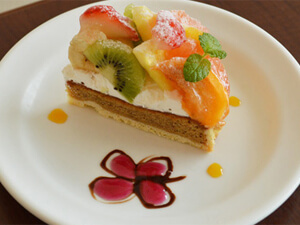 The restaurant delivers flavors loved by tourists, U.S. military workers, and local Japanese people. For details, go to the list of stores on the official website . *At some stores, you can place an order and eat while you’re parked. 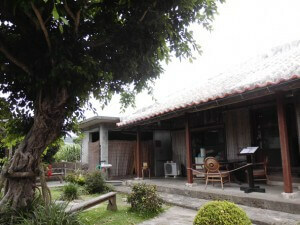 The photo is of the Nago store. *Although most stores are open 24 hours, business hours vary at some stores as follows; AM10:00-PM10:00 (Toyosaki Store). 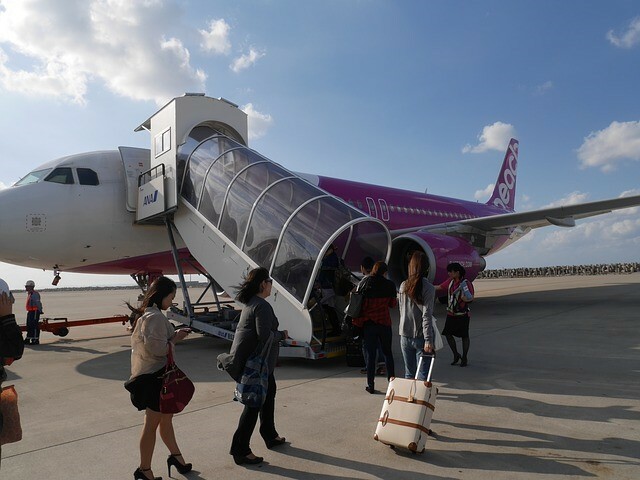 AM7:30-AM1:00 (Itoman Store), and AM8:00-PM7:15 (Miyako Airport Store). Also, for details go to the list of stores on the official website . If crowded, please use the take-out or drive-in service. 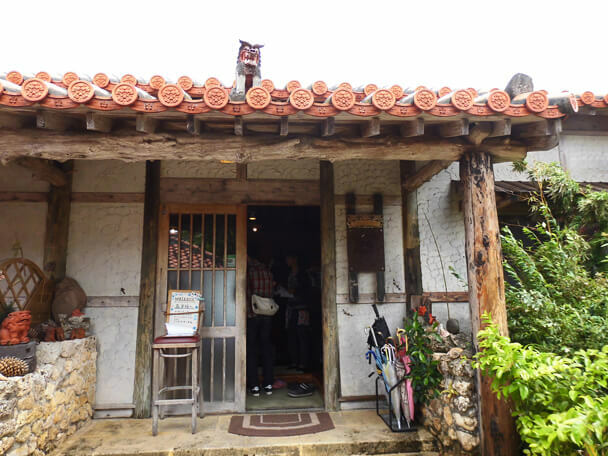 Yagiya, where Okinawa soba is served in a restaurant made in a genuine Okinawa architectural style and registered as a tangible cultural property in Japan. 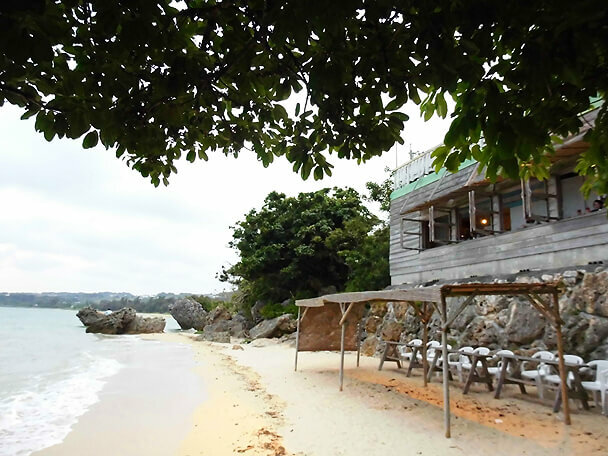 It’s a restaurant often recommended “if you’re going to eat Okinawa soba”. 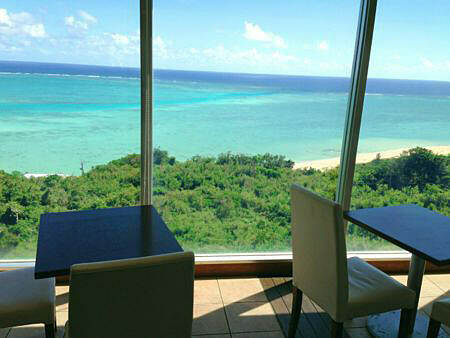 It’s located 30-40 minutes from Naha Airport, so you can easily go after arriving at Okinawa in the afternoon. 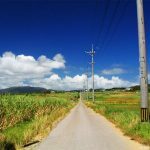 It’s surrounded by sugarcane and vegetable fields, and you’ll feel like you’ve gained a sense of Okinawa that you didn’t have before you came. Once you arrive, you’ll sense the history from the entrance. 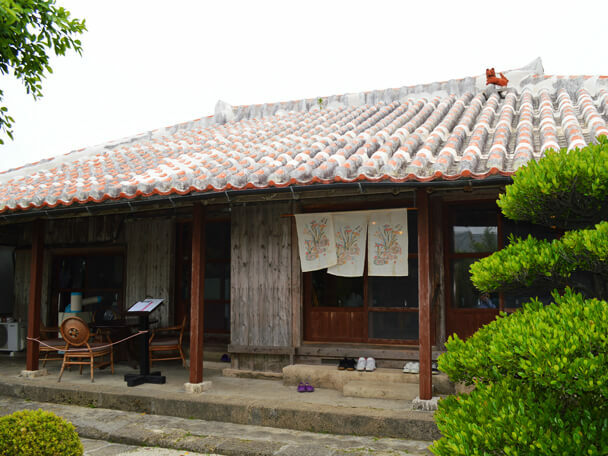 You’re welcomed by the statues of Shisa (Okinawan lion) at the entrance, and then you go to the main building and the attached Japanese-style house in red tiles. I arrived a little after 2 p.m., which is a bit late for lunch, but 80% of the seats were occupied. Indeed, it’s a popular restaurant. 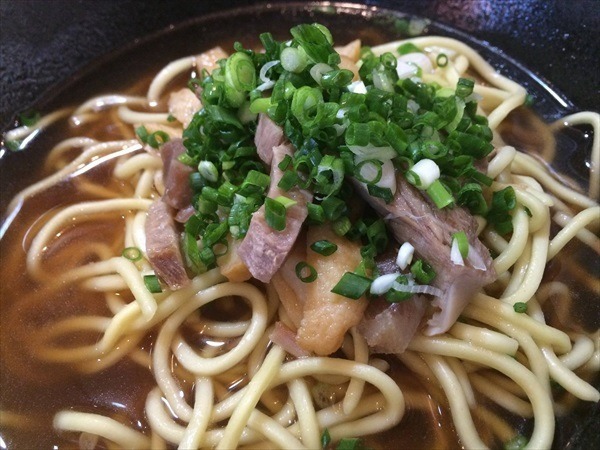 “Okinawa soba” has thick noodles and is more similar to “udon” rather than the “soba” generally known in Japan. 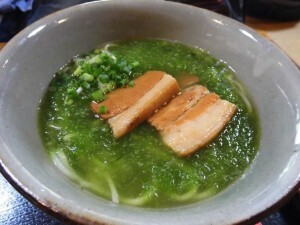 We tried “whole soybean soba with soy milk” and “asa soba (sea lettuce)”. “Whole soybean soba with soy milk” comes in a large portion. I was surprised at the boned rib and chunks of shima tofu. 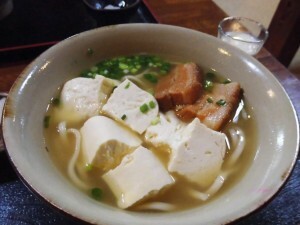 You may also drink the soy milk served with the soba. Although the tofu was just huge, I never got tired of the flavor of the tightly seasoned broth. “Asa (sea lettuce)” is this green thing. The dish is topped with noodles made with this light-flavored seaweed, boned rib, and lots of asa. Please walk around the site while you wait for your meal or before you go home. 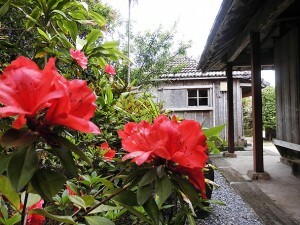 You can experience the feeling of visiting one’s grandparents’ house. Generally, closed on Tuesday. 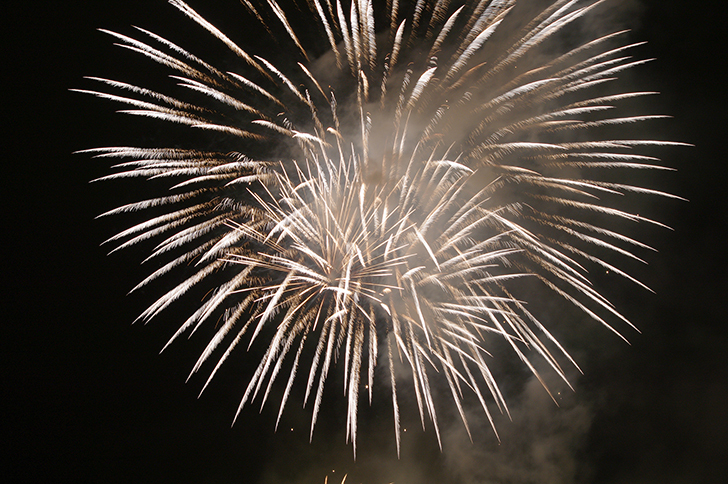 However, the store is open on holidays, during golden week, summer vacation, and end/beginning of the year. 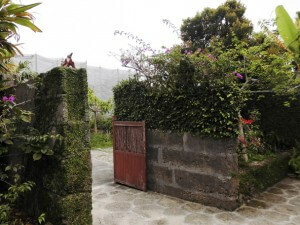 Click here for the detailed business schedule. 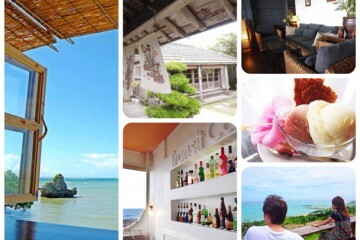 You can have specialty pizza in a Japanese-style house while gazing at the blue ocean. I heard that, and so I visited on Sunday in the middle of April. I still had 10 minutes until they opened at 11:30 a.m. and I thought I made it on time……but there were already many customers who had already arrived in the parking lot! I found a combination of rental cars and cars with local license plates. I heard of the store’s popularity on reviews but I didn’t expect it to be this popular. 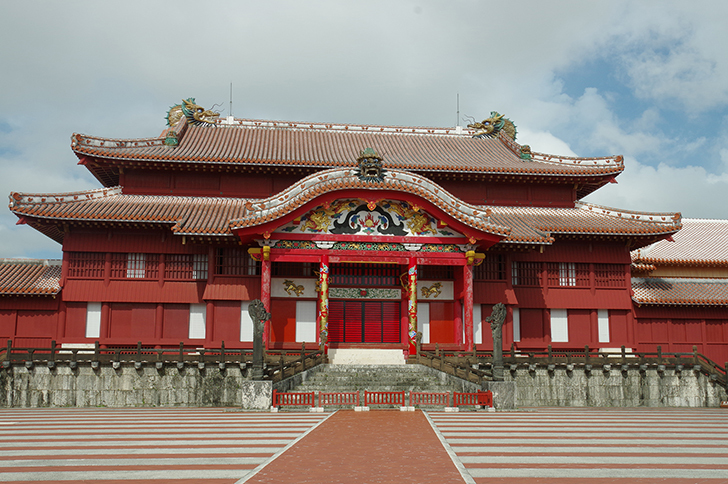 The exterior with red tiles and Shisa at the entrance fully present the atmosphere of Okinawa. It instantly enhanced my mood for the journey. In the meantime, several more groups arrived. I rushed into the house and a dozen sets of names were already on the the waiting list. 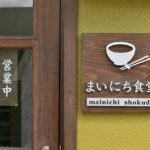 One of the characteristics of this restaurant is the Japanese-style house that’s reminiscent of the good old days of Okinawa. High ceiling, wood grain, and the open glass door present a graceful impression. We were seated right away, but the indoor seats were fully occupied. So we sat at a table outside. The outside tables are also lovely. 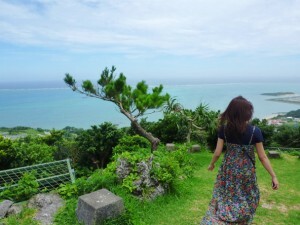 You watch the wind, the greenery, and the blue ocean. You can choose sizes from medium (serves 3-4 people/¥2,200) and small (serves 1-2 people/¥1,100) but there’s only one kind of pizza. 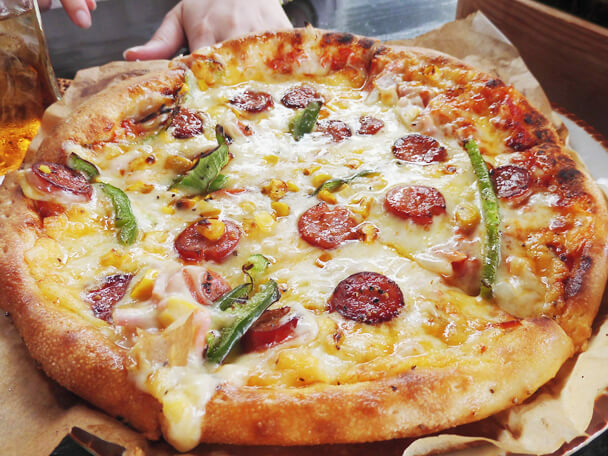 As you can see, toppings are pretty standard. It’s not like the pizza is rare, but I think the ingredients used are good and it’s just plain delicious. I can sense the confidence in their flavors and their challenge to the classic pizza. I can ravenously eat one after another because it’s that tasty. But each slice is pretty fulfilling, so sharing one small size with another person might be a good idea for small women. 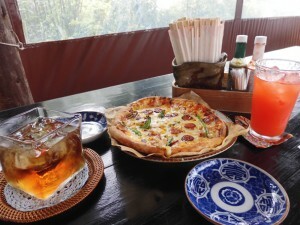 They bake pizza with careful attention, and one of the details they focus on is using “spring water from Okuni forest road”. People throughout the prefecture come and draw this slightly sweet spring water. Also, coffee is brewed with this spring water. I chose fresh acerola juice from Motobu and oolong tea for my drinks. 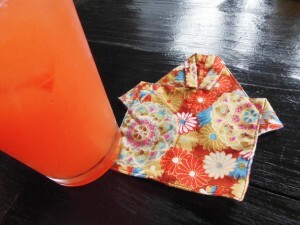 The beverage coaster is shaped like a Ryukyu costume and it’s cute! How does this dessert sound after having chunky pizza? 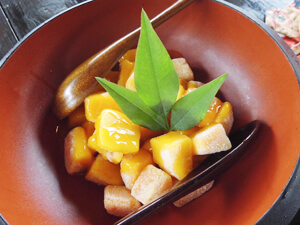 “(Cold) mango forest” (cut mangoes) ¥500. It’s cold mangoes (more like frozen). Because of its low price, I was imagining it to be a small amount, but I was surprised at the portion, which is a little more than what two women could finish. It’s piercing cold like ice cubes, but the texture is soft like mangoes. Again, I couldn’t stop eating. However, we were about to give up on finishing the dessert because we just had pizza……then, the staff wrapped it in a plastic container. Thank you! It became a good snack during the drive afterwards. 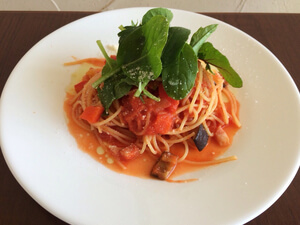 However, placing a takeout reservation is possible. Please inform the pick-up time to the staff in advance. Also, they said you can directly come to the store to order takeout and wait because baking pizza doesn’t take that much time. 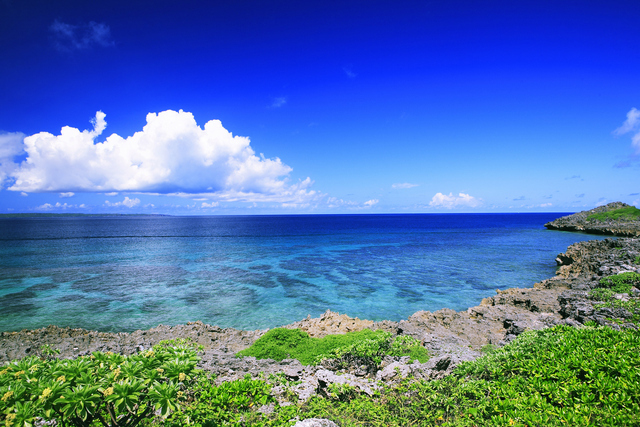 I bet many people would think of “the ocean” if you talk about Okinawa. However, as you actually drive around, you’ll find that it’s also full of trees. 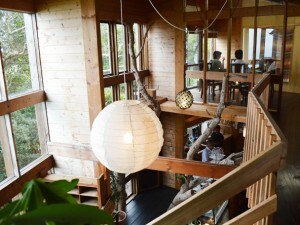 At “Café Fujyu”, it’s a wonderful location where you can enjoy both the ocean and trees. 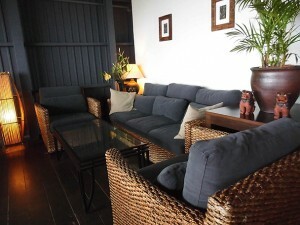 You can enjoy a variety of sceneries from the outdoor deck seats as well as the seats on the 1st and 2nd floors. 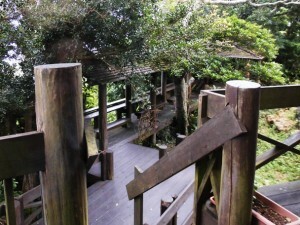 The deck seats are surrounded by trees. You go through the connecting corridor. Pets are allowed at these seats! If you look at the official website, records of many dogs that have visited the store are uploaded. Right after you walk into the building, you can better relish the color of the trees from the seats on the 1st floor. Seats on the second floor are connected with the stairwell and you’ll feel relaxed in the three dimensional space. Indoor seats and terrace seats are available on the 2nd floor. Here is my recommendation: the “original Fujyu zenzai (red bean soup)”! You may have thought, “What? Isn’t this shaved ice?” Zenzai in Okinawa is not the warm one you’re familiar with. 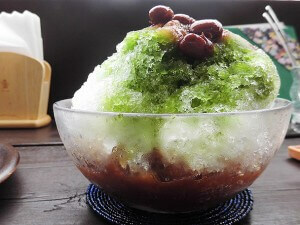 It’s a cold sweet with shaved ice and red kidney beans. The toppings of Okinawa-style zenzai vary by store. At Fujyu, matcha syrup and large red beans were tasty. The color nicely matches the atmosphere of the café! The beauty of the ocean matches the urban space design. 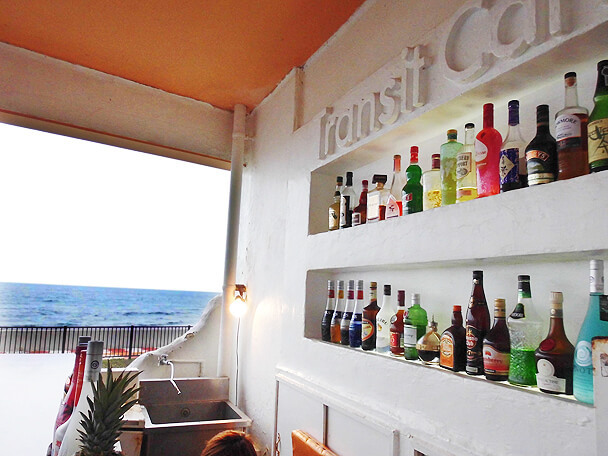 “Transit Café” is a café with a resort atmosphere that reminds you of somewhere away from Japan, and it turns into a bar at night. It’s located near Kadena base where you see American signposts in some areas. 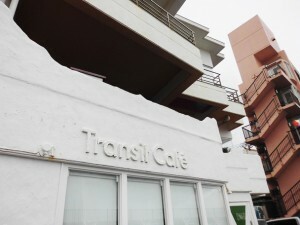 The building with white walls built along the coastline is the landmark. The inside also has white walls and the contrast with the dark brown table sets is cool. My recommendation is terrace seats! Just looking at the colorful bar counter was exciting even for someone like me who doesn’t know much about alcohol. For your information, pets are allowed at the terrace seats. 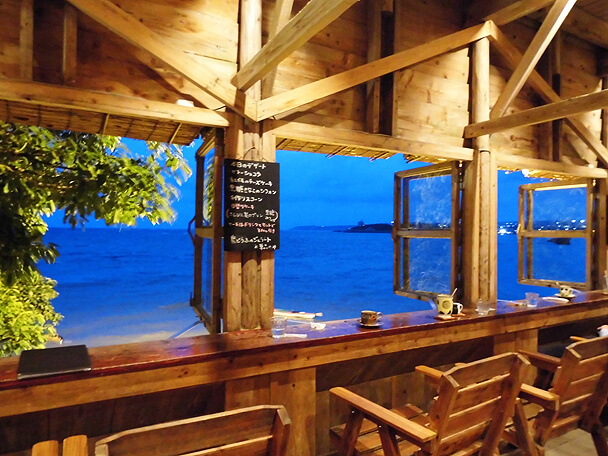 Because it turns into a bar at night, various cocktails are offered. 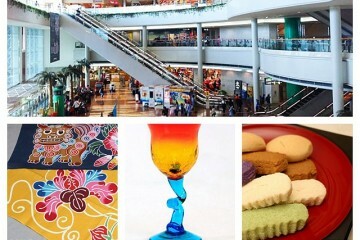 It’s also friendly for people who don’t drink because colorful cocktail-like soft drinks are available. These drinks deliver a resort feeling and boost the atmosphere. 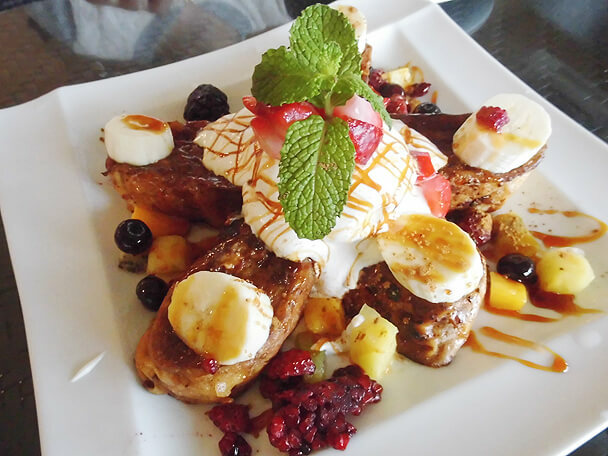 If ladies want to go there for the café, I recommend the “cinnamon French toast with ice cream topped with lots of fruits”. Although the portions are quite big, I cannot stop eating and it’s dangerous in a way. Share it with everyone and enjoy the condensed sweetness. A private parking lot is not available, but parallel parking on the coastline in front of the store is allowed. Lunch: from 11:00 a.m., last order: 4:00 p.m. According to the staff, phone reservations are recommended for especially busy hours during lunch time (11:00 a.m.-2:00 p.m.), dinner time (5:00 p.m.-9:00p.m. ), and on the weekend. In my case, I made a reservation in the evening on Sunday. Although the evenings are not busy, I could only stay until 5:00 p.m. because the reservations for dinner were full despite the rain.